Just a few years after the boom, energy companies are shedding distressed wells for next to nothing. It’s a brisk trade in junk assets — and it’s going virtually unchecked by regulators. Who will pay to clean it up? Medicine Hat, Calgary, Toronto and Lancer, Sask. An inactive Sequoia well site near Ponoka, Alta. Harold Wang was driving a hard bargain. In the summer of 2016, the Hong Kong businessman was closing in on a sweetheart deal to acquire a major foothold in Alberta’s oil patch by establishing a brand new company. The price tag: $1. For weeks, he had been in talks with Calgary-based Perpetual Energy Inc. and its CEO, Sue Riddell Rose, to buy thousands of aging natural-gas wells. Despite the pittance he was preparing to pay, negotiations had bogged down. By early August Mr. Wang, who had previously worked at major U.S. investment banks, was firing off an e-mail to Ms. Riddell Rose in which he threatened to put the deal on hold. After all, the acquisition was not without major risks. Many of the wells were nearing the end of their economic life, and the deal included the assumption of future cleanup costs, pegged by the seller at $133.6-million; Mr. Wang’s company simply did not have the financial wherewithal normally required to convince the Alberta Energy Regulator (AER) that he could afford such a cleanup. No matter, as that environmental bill had been glossed over: The deal had been structured in such a way that the AER – an industry-funded agency that operates at arm’s length from the provincial government and is charged with both promoting and policing the oil business – would not be able to assess whether Mr. Wang’s new company could meet the obligations. Still, he continued to play hardball. “Sue – it doesn’t work for us,” he wrote in an exchange with Perpetual’s boss, whose family is among the most prominent in Calgary’s business community. What followed was a complex deal that exemplifies the dangers of a brisk trade in high-liability energy assets now confounding governments and their regulators. Within 18 months, Mr. Wang’s company, by then named Sequoia Resources Corp., would be insolvent, triggering disputes over how it was allowed to buy up energy properties in the first place – and who would cover the costly cleanup of the wells. The Globe and Mail spent six months poring over court records and delving into thousands of pages of corporate and government documents, obtained via freedom-of-information laws, in an effort to shine a light on a murky corner of the oil and gas business that has flourished through the prolonged slump in commodity prices: the buying and selling of wells and production plants saddled with major environmental liabilities. Along the way, The Globe has also scoured oil- and gas-well databases in British Columbia, Alberta and Saskatchewan, examined several companies’ fiscal reports and public statements and interviewed dozens of industry executives, landowners and bankers. The reporting points to a looming financial and environmental crisis: Of the 610,696 oil and gas wells in those three provinces, some 20 per cent are sitting inactive, according to The Globe’s data. Almost two-thirds of these 122,456 idle wells have been shut off for more than five years. And a growing proportion are owned by companies that can least afford to clean them up – a process known as reclamation – when their commercial life ends. Costs have already overwhelmed dedicated cleanup funds set up by the industry, put a strain on regulators and prompted Alberta’s NDP government to step in with hundreds of millions of dollars in loans. Note: Saskatchewan only provided data for 2005 and 2018. Sequoia is a prime example of the fallout, though it is far from unique. Led by Mr. Wang and financier Wentao Yang, it filed for bankruptcy this year after amassing thousands of wells and related facilities in a rapid-fire series of deals, starting with Perpetual’s assets. It kept buying even though it did not have enough money to cover the costs of reclamation according to the AER’s threshold of financial fitness. Mr. Wang’s bargaining is detailed in an affidavit from Ms. Riddell Rose that is part of a lawsuit filed by the bankruptcy trustee, PricewaterhouseCoopers, in its efforts to recoup some of the costs for decommissioning the aging sites. Neither he nor Mr. Yang would comment for this story. In the oil patch, pliant regulators have enabled well-known companies, including Husky Energy Inc., Enerplus Corp. and others, to foist cleanup costs onto small companies that are buying up the distressed wells of those bigger players. In some cases, those smaller players are purchasing the assets even though they are unable to secure financing from major banks. The risky bet is that natural-gas prices will rebound and deliver payoffs big enough to generate profits while also funding the cleanup of old wells as they peter out. But the gamble has stirred a backlash in the industry. It has also angered landowners who complain of being shortchanged on lease payments from energy companies. And ultimately it has left taxpayers to shoulder a financial and environmental mess. In Alberta, a string of corporate bankruptcies has already pushed the number of defunct well sites to 4,349, up from 545 in 2014, necessitating a $235-million loan from the provincial government last year to shore up the fund set aside by industry to pay for cleanup. And that count does not yet include any of Sequoia’s wells. Sequoia is just one player in a wider scheme that could push cleanup costs substantially higher for such wells across B.C., Alberta and Saskatchewan. Depending on assumed costs for plugging and reclaiming wells, the tab could easily climb to $13.2-billion, and reach as high as $26.9-billion, if companies on the brink of insolvency and other struggling firms were to collapse, according to a Globe analysis. Brad Maynes, left, and Ken Wright of the City of Medicine Hat’s Natural Gas and Petroleum Resources division discuss an abandoned gas well site on the outskirts of the city. Through the middle of the past decade, natural gas was Canada’s economic trump card. Tight U.S. supplies pushed up prices, providing incentives for companies to tap even small, shallow reserves across the Prairies. The upshot: a drilling boom that sent profits soaring – and royalties gushing into provincial budgets. But then came the shale-gas fracking revolution, which allowed the U.S. industry to access massive reserves near major population centres. Early this month, Alberta gas was selling for less than $2 a unit. That’s one-sixth what it fetched at the market peak in 2005 – and even less than the $3 and change it got in 2014. This past summer gas traded, at times, for negative values. Medicine Hat, Alta., is struggling with the new market reality. Some wells in the city date back more than a century. Over the years, the city itself had become an active gas driller, padding the municipal budget with large dividends. 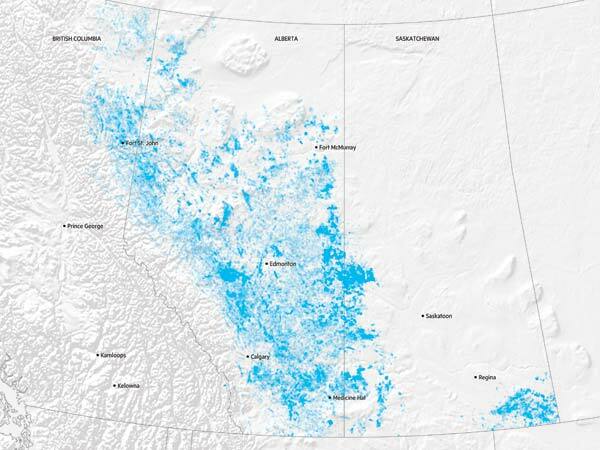 But today drillers are largely bypassing this corner of Alberta. New investment is more likely to come from an altogether different sector: On a 71-acre spread near the city’s outskirts sits the makings of Aurora Cannabis Inc.’s massive greenhouse. The civic moniker, “The Gas City,” feels distinctly out of date. “We haven’t seen new gas drilling for a long, long time down here,” said Brad Maynes, manager of the municipal energy division. Across the Prairies, the prolonged downturn in prices has aggravated concerns, as inactive wells – and their future cleanup costs – languish on the books of Perpetual, Husky, Enerplus and others. As wells age and production declines, such obligations are like pension funds faced with growing payouts as beneficiaries retire, says Jeremy McCrea, an analyst at Raymond James Ltd. in Calgary. Meanwhile, costs such as maintenance, lease payments to landowners and municipal taxes remain elevated, even as production falls. None of which pleases investors. “Companies with higher abandonment liabilities trade at a bigger discount than their peers,” Mr. McCrea noted. Keith Wilson, an Edmonton-based lawyer who represents landowners in disputes with energy companies, is blunt. “The commerce of the business is to take high-value producing wells, produce them as much as you can, and then, as soon as the economics become marginal, hand them off to someone else and include the liability within it,” he said. Along with those liabilities have come growing risks for governments, as companies with weak finances have snapped up money-losing wells in an ill-advised roll of the dice on natural-gas prices. of top 10 sellers, Husky Oil Operations. one of top 10 sellers, Husky Oil Operations. wells or more, involving the top 10 sellers. At least 140,367 oil and gas wells have changed hands in Western Canada since 2015, some for as little as $1. depicts transfers of 100 wells or more, involving the top 10 sellers. The deal-making has been heady. Data compiled by The Globe from Canada’s three westernmost provinces show that at least 140,367 oil and gas wells have changed hands since 2015, the year after the price crash took hold. Of those, almost half were transferred to companies with subpar financial status as determined by Alberta’s regulator. Buyers include holding companies and firms that are anything but household names, such as ACCEL Canada Holdings Ltd., Acquisition Oil Corp. and COR4 Oil Corp. Many are small firms with only a handful of employees and were created in the past few years. In 2016, the AER did, in fact, toughen rules, essentially requiring that the value of a company’s assets be at least twice the deemed liabilities upon completion of an acquisition. But the standard has been only loosely enforced. Meanwhile, some companies have gone to great pains to simply circumvent the scrutiny. Perpetual Energy set up a structure that allowed it to do just that, Sequoia’s bankruptcy trustee alleges in the suit filed against Perpetual and Ms. Riddell Rose. Rather than transferring assets to Mr. Wang’s outfit, the suit alleges, Perpetual sold shares of an established subsidiary that held the wells. One result: The AER was prevented from ruling on the deal’s acceptability. Ms. Riddell Rose denies that was the reason for setting up the structure, saying, rather, that it just made things simpler, given the many and varied assets Perpetual was parting with. The trustee, PricewaterhouseCoopers, alleges in its suit that Perpetual and its CEO knew the hefty liabilities in the deal would render Sequoia insolvent – a charge both she and Perpetual deny. The trustee is seeking $217-million in damages on behalf of creditors – which include major energy companies, suppliers and municipalities – if it fails to convince a judge to annul the sale. The allegations have not been proved in court. But one thing is certain: The Perpetual transaction sparked a deal spree by Sequoia. Sources close to the company say it kept buying in order to achieve a large enough asset collection to make it of interest to Chinese investors. Along the way, it sought breaks on millions of dollars in unpaid municipal taxes. Ultimately, however, such efforts weren’t enough to salvage the faulty business plan, as gas prices plunged even lower, sinking any hope of attracting outside capital. By far Sequoia’s biggest creditor is the AER, which is on the hook for $225-million to decommission the company’s 3,200 or so wells and related facilities in Alberta. The regulator has acknowledged the loopholes that saddled it with those costs. But it has yet to say how it will close them. The wider trade in distressed oil and gas assets is playing out as a glut of heavy crude in Alberta sparks calls from some executives for government relief. In recent weeks, prices for oil sands crude have plunged to such a degree that some of the industry’s most financially resilient players are now urging the province to legislate supply quotas to end a crisis they insist is hurting not only companies but government revenues and the broader economy. The trafficking in aging wells has garnered comparatively few headlines, but it bears some resemblance to the U.S. subprime-mortgage crisis, in which borrowers with little financial capacity racked up big debts that were bundled and sold as securities. Defaults on those mortgages were a factor in the near-collapse of the global financial system in 2008. In this case, it isn’t mortgage holders who can’t make their house payments, but oil companies that do not measure up to the regulator’s version of a credit score. But if the AER was worried about risky asset transfers, it did little to stop Sequoia from piling on more liabilities. Just days after the purchase of Perpetual’s assets closed in late 2016, a bankruptcy receiver for insolvent Waldron Energy Corp. contacted AER staff with an urgent request: A prospective buyer, later revealed to be Sequoia Resources, was interested in about 225 of Waldron’s money-losing wells and other equipment. But there was a catch: AER rules prevented the buyer from acquiring the assets. FTI Consulting Canada Inc., the receiver whose job it was to liquidate Waldron’s assets, asked the AER to apply discretion. Approval came swiftly. “Will be nice to have this one wrapped up for Xmas break,” Marvin Koochin, then a receivership-and-compliance specialist at AER’s liability-management branch, told colleagues in a Dec. 21, 2016, e-mail. It was not an isolated exemption. Since June, 2016, the AER says it has received 373 requests to relax its toughened rules. Of those, it has denied only 23. Abandoned Sequoia facilities at a well site near Ponoka, Alta. Sequoia filed for bankruptcy this year. In the case of Sequoia, e-mail correspondence shows that executives repeatedly assured AER staff that the company had a plan to arrest financial losses inherited from Perpetual, even as Sequoia snapped up distressed assets from Waldron and another bankrupt energy producer, Endurance Energy Ltd. The AER has said it did not collect security deposits – typically required in transfers of wells to financially precarious producers – in several of the deals. Then, in June of 2017, Sequoia Resources bought natural-gas assets that were burdened with $22.8-million in associated liabilities from Husky Energy. As part of the deal, Husky gave Sequoia $6.5-million, with half of that held in escrow to help pay for well cleanup over two years. Two months later, Sequoia’s Mr. Wang and Mr. Yang agreed to acquire another 2,644 wells from Husky, with liabilities of $135-million. Almost 50 per cent of the wells were inactive, according to documents filed with the regulator outlining the purchase. This time around, the buyer was not Sequoia Resources but Sequoia Operating Corp., a related company run by the same management and from the same office. Sequoia Operating, which now goes by the name AlphaBow Energy, also picked up assets at bargain prices from OMERS Energy, Superman Resources and debt-saddled Pengrowth Energy Corp.
Every single deal received the AER’s blessing. The paperwork was routine. On Aug. 4, 2017, Vicki Benoit, chief operating officer of Sequoia Operating, wrote to Hélène de Beer, then the AER’s director of closure and liability, outlining plans to buy what she called “low-risk oil and gas wells” from Husky. By its own math, however, Sequoia’s financial position would deteriorate as a result of the transaction, according to documents it filed with the regulator in support of the asset-transfer process. For Husky, majority-owned by companies controlled by the family of now-retired Hong Kong billionaire Li Ka-shing, the sales were part of wider efforts to shore up finances bruised by the collapse in oil prices. By late 2017, Husky had shed about $840-million in long-term cleanup obligations, primarily through asset sales in Western Canada. Husky spokesman Mel Duvall insists the company takes into account the creditworthiness of purchasers and prevailing market conditions before it sells assets and will include money for cleanup if needed. He would not comment on the specific terms of many of the transactions, but he noted that AlphaBow Energy remains a solvent operator. He said Husky had spent $136-million on well cleanup in 2017, up from $87-million in 2016. The life of an oil or gas well can be long, spanning an average of 20 to 30 years. When a well reaches the end of its production life, it can enter a period of dormancy before finally being abandoned and decommissioned. Abandoning a non-producing well can be an expensive proposition entailing plugging, sealing it with concrete and cleaning up any possible contamination. The final step is restoring the land to its original state. After locating an oil or gas deposit and obtaining rights, a drilling rig is brought in to bore a hole to the licensed depth. The wellbore is lined with a steel casing to prevent collapse and groundwater contamination. Drilling mud is pumped continuously to wash out drilling debris. Once a well is completed, production tubing is inserted and the drilling rig is replaced by ‘Christmas tree’ valves or a pump if the pressure of hydrocarbons is insufficient. A well is deemed active if it produces “volumetric activity” or flow. It is considered inactive after months of no activity. In Alberta, suspended wells are inactive wells that follow strictly regulated safety procedures. Abandoning and decommissioning a well is a long process. It entails removing the pumps and other production equipment, filling the wellbore with cement and capping the wellhead according to provincial and federal regulations to prevent contamination of the surrounding area. The final step in abandoning a well is reclaiming the land and returning it to its original state. Energy companies must follow a detailed plan, removing any hazards or contamination. In Alberta, for example, the regulator issues a certificate when this process is complete. Sequoia’s collapse has cast a critical light on the AER’s ability to gauge financial risk, not least when assets change hands. This year, Canadian Natural Resources Ltd. – the oil-and-gas giant chaired by billionaire Murray Edwards – has launched dozens of regulatory appeals and several lawsuits to block deals it says expose the industry to billions of dollars in cleanup costs due to the perceived insufficient funds of buyers. Such costs are borne by the industry cleanup fund; payments are proportional to a company’s liabilities. CNRL’s extensive holdings and sizable backlog of dormant wells effectively mean it foots the largest share of the bill when other players fail. He would not discuss specifics – whether, for example, companies should be required to post cleanup bonds upfront, before they drill a well. But it’s clear CNRL’s interventions are not limited to Alberta. It has sued Predator Oil BC Ltd. and Ranch Energy Corp. over a complex transaction in B.C. Ranch Energy billed itself as a specialist in buying up and reclaiming aging assets burdened with expensive cleanup obligations. According to affidavits filed as part of the company’s receivership proceedings, it aimed to use cash flow from the production of oil and gas to systematically clean up wells as they petered out. In this case, the cash was also needed to pay off a hefty debt in a related business (providing airplane and helicopter service to the oil industry) for which Ranch was in default. The acquisition was effectively a flier on gas prices, one that proved tragically optimistic. It was a flawed business plan that also triggered a court battle with Ranch’s lender over what to do with assets carrying tens of millions of dollars in abandonment costs. Ranch’s insolvency now threatens to add to the province’s growing tally of defunct sites. That number has swelled to 294, up from just 24 in 2014, according to the BC Oil and Gas Commission, the provincial agency that hands out drilling permits and oversees asset transfers between companies. The increase has overwhelmed cleanup funds in B.C. Just $5.3-million was available as of March, 2017, against a total cleanup cost estimated at $40-million to $60-million. What could well cleanup costs be in Western Canada? Documents from legal actions surrounding the Ranch saga portray a large company selling off past-their-prime wells to a smaller player with insufficient finances by setting up a deal structure that skirted government rules. The attempt ended in disarray. In 2017, Ranch Energy bought interests in 1,600 wells and other equipment in northeastern B.C. from Predator, which had earlier purchased the wells from Penn West Petroleum Ltd. (now called Obsidian Energy Inc.), a much larger company than either Ranch or Predator. Penn West itself had long struggled with high abandonment liabilities due to a history of acquisitions. Ranch CEO Ryan Tobber had created his company that spring to acquire the Predator assets, located near Fort St. John. All but a fraction of the wells pumped natural gas. But there was a snag: Ranch’s balance sheet did not meet the BC Oil and Gas Commission’s threshold for financial health. It would cost an estimated $105-million to clean up all the wells – about $2-million more than they were worth in the market. Court documents show that Third Eye Capital of Toronto advanced Ranch $10-million to buy the assets. To complete the deal, Predator agreed to hold the licences in trust until the commission deemed Ranch’s books healthy. Predator also posted a letter of credit for $15-million to satisfy the regulator’s requirement for financial assurances. Under this complex arrangement, Ranch essentially took ownership of the wells, while Predator still held the operating permits. Mr. Tobber then formed a numbered company and acquired all of Predator’s shares in a corporate takeover, making him its sole shareholder as well as its CEO. In an affidavit filed in an Alberta court this past July, he notes that Ranch’s cash flows were sapped by a 60-per-cent drop in natural-gas prices since the time he bought the assets. Even so, he took on more debt – and even proposed buying more wells. He did not return an e-mail and a phone call seeking comment. In the end, Ranch defaulted on its loans to Third Eye and was pushed into receivership by the lender. Last month, an Alberta court allowed for a sale process of the wells to begin, opening the door to yet another operator taking on those hefty liabilities – assuming a buyer emerges at all. The receiver, Ernst & Young, scrapped the trust agreement between Ranch and Predator, under which Ranch owned the assets while Predator held the related permits. It did so largely because Ranch could not foreseeably raise enough cash to satisfy BC Oil and Gas Commission requirements to own the permits – and also due to doubts over Mr. Tobber’s business savvy. The receiver also noted that the wells were quickly falling into disrepair, citing a pipeline leak last July and an ongoing dispute over disposal of wastewater left behind by drilling operations. Neither Third Eye nor Ernst & Young would comment when contacted by The Globe. The BC Oil and Gas Commission said it is monitoring the proceedings closely and will take the steps necessary to make sure the public and environment are protected. CNRL has joint interests in several of the wells that predate the Ranch deal. It is suing both Predator and Ranch for $2.4-million for unpaid bills related to road-sharing and other agreements. CNRL wants a judge to declare that Predator’s sale of the assets to Ranch “was of no force and effect” – in other words, that it never really occurred. An abandoned Redwater Energy site near St. Albert, Alta. Redwater’s bankruptcy has led to a Supreme Court challenge. Across Western Canada, regulators insist they are paying close attention to who is buying oil and gas wells. This past April – on the heels of a fiscal year in which the BC Oil and Gas Commission says it rejected two of 60 permit-transfer applications, and where nearly a third of the wells in the province are inactive – the B.C. government enacted legislation to increase an industry levy that funds the cleanup of defunct sites. It is also toughening regulations, with the aim of preventing operators with checkered histories from producing oil and gas in the province. In Alberta, the AER is embroiled in a Supreme Court case involving insolvent Redwater Energy Corp. At issue is a lower-court ruling, from 2016, that effectively put the interests of secured creditors – including provincially owned ATB Financial – to recoup money on soured loans ahead of regulators’ ability to enforce the cleanup of old, unproductive wells when a company goes bust. A decision from the top court is expected soon. Should its appeal fail, the AER has warned of more pressure on an already strained system. And strained it is: CNRL, lawyers and landowners have all criticized the regulator for lowballing risks. Industrywide, the AER pegs total liabilities at about $58.7-billion. In fact, documents made public by the regulator say the industry’s ultimate cleanup bill for everything from pipelines to tailings pits could swell to $260-billion. Against such risks, the regulator says it has collected about $1.6-billion in security deposits. Meanwhile, a wider policy review to address the glut of dormant wells and future industry liabilities that was launched by Premier Rachel Notley’s NDP government has stalled after initial consultations. A spokesman for Energy Minister Margaret McCuaig-Boyd said the minister was unavailable for comment. Alberta’s Auditor-General is also studying the issue but is not expected to release findings until after next spring’s general election. Policymakers in Saskatchewan have floated changes that would require companies to post higher security deposits when transfers involve large numbers of wells facing major cleanup obligations. The provincial Ministry of Energy and Resources has tested the new model and insists it ensures enough money is collected to cover eventual cleanups. Publicly, at least, even the industry itself says it is on board. “We want to make sure that the participants in the market are willing and able to discharge their end-of-life obligations,” said Brad Herald, vice-president of Western Canada operations for the Canadian Association of Petroleum Producers. But many likely won’t be able to meet those obligations. In Alberta alone, 45 per cent of producers are in a precarious financial state, according to the regulator’s financial test. These companies account for 28,523 wells. They include SanLing Energy Ltd. and Houston Oil and Gas Ltd.
An Abbey Resources well site near Lancer, Sask. Farmers are calling on Abbey to enhance weed control around its sites. The problems aren’t going away. Stretching beneath an immense swath of flat prairie and rolling sand hills, the Shackleton gas field in southwestern Saskatchewan once minted fortunes for investors. In 2002, Husky announced plans to drill 170 wells in the newly discovered shallow-gas reserve. Four years later, a company called Profico Energy Management Ltd. sold its holdings in the region to Focus Energy Trust in a $1.2-billion deal. Focus then merged with a forerunner of Enerplus in a transaction worth about $1.4-billion. These days, following a decade of low gas prices, production has slowed to a trickle. Husky and Enerplus have handed off most of their wells to little-known Abbey Resources Corp. The company’s president, Jim Gettis, has conceded he acquired some of the drilling leases for as little as $10, a minuscule sum for assets that once changed hands in billion-dollar deals. But despite that sweet entry fee, Mr. Gettis says he needs to cut costs if he is to revive the wells and make his business plan work. At least that’s what he told farmers at a meeting at the Living Sky Casino in Swift Current, Sask., this past April. In his pitch, now posted on YouTube, he asks farmers to swallow a 50-per-cent cut in lease payments – which can run between $1,000 and $3,000 a year – for wells on their grain fields. He also outlines plans to ask local municipalities for a tax break. Just before the meeting, he had been proposing to offer shares in Abbey in lieu of annual lease payments, but he scrapped that idea when it became clear it wouldn’t fly with the 100-plus farmers in the casino’s theatre. Months later, about a dozen farmers gathered for coffee on an early September morning in a former grocery store they chipped in to buy and turned into their hub. And they were still steaming. Farmers meet for early morning coffee in Lancer, Sask. They are frustrated that Abbey Resources is not paying its full lease payments. After the casino meeting, the company had sent a letter to each farmer stating that Abbey was immediately cutting its lease payment in half – and that cashing the enclosed cheque would signal acceptance of the company’s “rent reduction program.” For those who didn’t accept, their wells “will have to be abandoned,” read the letter, signed by Mr. Gettis. Some of those farmers that September morning planned to seek legal advice. Others had cashed the cheques and sent their own letters back, stating they did not agree to the rent-reduction terms and that they expected their contracts to be honoured in full. Farmers aren’t the only ones being shortchanged. Instead of paying its full 2017 and 2018 property taxes – totalling more than $3-million – to four regional municipalities and the local school division, Abbey instead tried to cut deals with them. Two municipalities have refused his terms; one has partially agreed, while the other recently accepted. All of which, farmers say, raises another question: If Abbey can’t afford its rent and taxes, how can it afford to maintain its wells – and clean them up when they’re no longer productive? And if it can’t do that, why was it allowed to acquire them at all? Near an Abbey gas well, farmer Kelly Bradford checks his wheat crop outside of Lancer, Sask. The answer, at least in part: A letter of credit – guaranteeing payments of almost $28-million in the event that Abbey fails and can’t clean up its 2,345 wells – has been posted with the Saskatchewan government. But not by Abbey; it didn’t have the funds. Enerplus and Husky committed the security deposit instead, said a spokesperson with the Ministry of Energy and Resources. That might have helped smooth the way to Abbey assuming custody of the assets – but landowners say it won’t be enough, should Abbey’s plans not pan out, to plug and reclaim all the wells. And there are lots of them: They would nearly sextuple the province’s so-called orphan-well count, currently at 516, unless yet another company were to buy them. “It’s too easy for these people to buy a company or properties,” said farmer Barry Tuchscherer, “and not worry about the liability.” Mr. Tuchscherer knows the Shackleton gas field intimately: He was a lead operator, akin to a foreman, for Enerplus for 15 years. The company was a good employer, he says. It cleaned up many wells that were no longer viable and it paid farmers lease payments in full. But he thinks the government should collect more money up front from companies when times are good, so that the cash is there for reclamation when a downturn comes along. In an interview, Drew Mair, manager of investor relations for Enerplus, said it transferred its Shackleton wells because they were no longer essential to its core business. In any case, he added, Enerplus is not offloading its environmental responsibility; he noted it is reclaiming 600 wells, at its own expense, that Abbey didn’t want. Sources: Data for all visualizations in this series are sourced from the Alberta Energy Regulator, the BC Oil and Gas Commission, Saskatchewan’s Ministry of Energy and Resources, the Provincial Auditor of Saskatchewan and the Orphan Well Association. Credits: Jeff Lewis and Jeffrey Jones, reporting; Chen Wang, data analysis; Renata D’Aliesio, reporting and project editor; Dennis Choquette, Gary Salewicz, Victor Dwyer, Massimo Commanducci and Christopher Harris, story editing; Todd Korol, photography; Theresa Suzuki, photo editing; Matthew French, design and art direction, Brennan Higginbotham, art direction and graphics; Sébastien Thibault, illustration; Christopher Manza, web design and development; Matt Lundy, digital editing; Matt Frehner, visuals editing; John Sopinski and Murat Yükselir, graphics; Melissa Tait, video; Tom Cardoso, graphics and data verification; Michael Pereira, data verification; Rick Cash and Stephanie Chambers, research. Editor’s note: (November 26) An earlier version of this article incorrectly said Perpetual set up a subsidiary for wells it sold to Sequoia Resources Corp. In fact, Sequoia bought the shares of an established subsidiary that held the assets.